For this month's "Maps Of The Month" featurette, I wish to draw your attention to Zeric's Super Mario All-Stars (Super NES) maps. Super Mario All-Stars takes the NES Super Mario Bros. games, adds upgraded graphics and music, the ability to save your progress, and crams them all in a single Super NES cartridge. There are the iconic Super Mario Bros., both versions of Super Mario Bros. 2, and the best-selling Super Mario Bros. 3, for a total of four Mario games! Later on in the Super NES's life, it was even bundled with the console itself (and with a fifth game, Super Mario World)! And if you missed them even on the NES and Super NES, you could play them yet again on the GBC/GBA, and then the Wii Virtual Console, not to mention the limited edition being released for the Wii this month, in honour of the 25th anniversary of Super Mario Bros. earlier this year. Clearly Nintendo won't deny anyone the opportunity to replay these classic games! The sixth time recognized as Mapmaker Of The Month, Zeric truly deserves the honour here, and it's surprising that compilation hasn't been featured as Maps Of The Month before! After all, we're talking about mapping four games all by himself! And not just any four games, but the collection of the most iconic Nintendo video games of all time! 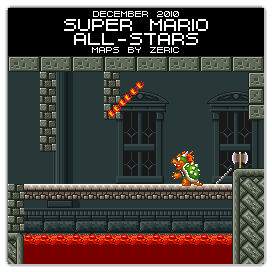 So to recognize the effort put into making these all-star maps, Zeric's Super Mario All-Stars will be known as VGMaps.com's Maps Of The Month for December 2010. 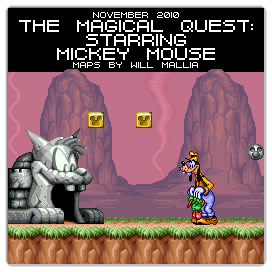 For this month's "Maps Of The Month" featurette, I wish to draw your attention to Will Mallia's The Magical Quest: Starring Mickey Mouse (Super NES) maps. When Pluto runs off while chasing a ball, he is captured by the evil Emperor Pete. With the help of magical suits, Mickey makes his way to Emperor Pete's castle to save his pal. Sure, it's not the most exciting story for a video game, even for its time, but it sets up the framework for a great combination: solid Capcom platforming action starring recognizable Disney characters with great Super NES graphics. I've said time and again that the Capcom/Disney games for the NES and Super NES are excellent examples on how to make licensed games that are actually fun. And look great! Truth be told, you probably won't get lost while playing this game, but the maps are still awesome to view just to look at the detail and colour and care that Capcom put into Super NES graphics. This game is actually the first of a trilogy, the second game being The Great Circus Mystery: Starring Mickey & Minnie, and the Japanese-only Mickey to Donald Magical Adventure 3 (J). All three games were rereleased worldwide for the Game Boy Advance between 2002-2005. While there are some additions to the GBA games, such as the inclusion of Minnie in the first game, the maps should suffice if you're playing either the console or portable versions. The entire trilogy has been mapped by the same person, Will Mallia. Will Mallia is easily the largest contributor to VGMaps.com, so it is actually a little surprising that this is "only" his fourth time being recognized as Mapmaker Of The Month. Congrats, Will! Oh, and Mickey Mouse turns 82 years old this month, and is still starring in video games even to this day. Happy birthday, Mickey! So to recognize the effort put into making these epic Mickey maps, Will Mallia's The Magical Quest: Starring Mickey Mouse maps will be known as VGMaps.com's Maps Of The Month for November 2010. For this month's "Maps Of The Month" featurette, I wish to draw your attention to TerraEsperZ's Castlevania: Aria Of Sorrow (GBA) maps. While in Japan, high school exchange student Soma Cruz goes to see the first full solar eclipse of the 21st century. But when he and his friend Mina reach the gate of the Hakuba shrine, his senses dim. The next thing he knows, they're in Castlevania, the home of the immortal Dracula. Not only that, but Soma can absorb the souls of enemies and use their powers! Now he must fight his way through Castlevania and, according to a mysterious man named Genya Arikado, make it to the master's chamber to be able to leave this castle within the eclipse. But what secrets will he discover on his journey? Even in the future (the game is set in 2035), the Castlevania series is mostly familiar. Sure, there's soul-absorbing in this one, but it's still Super Metroid-inspired power-collecting, castle traversal gameplay. But, one thing you can always count on to be different is the layout of Castlevania! The castle hasn't let the trends of the future affect its mostly gothic design and architecture, but it's still quite different, as it is every time. It doesn't have duality as in Harmony Of Dissonance, but this time it has an underground coliseum, a pirate ship, a large waterway system, floating gardens, and a gate to the Chaotic Realm! Did I mention that it's inside an eclipse? And what more could you ask for? Why, maps to get around Castlevania, of course! 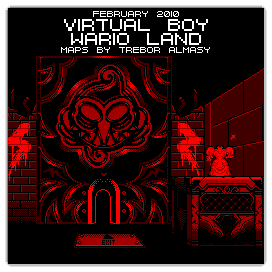 Multiple Mapmaker Of The Month TerraEsperZ always seems to have a number of ambitious projects on the go, but one that we are glad he has finished is the complete map of the third GBA Castlevania game. As is almost tradition here on VGMaps.com, the month of October is a good one to revisit the halls of Castlevania, so if you find yourself lost in this castle of the future (and in an eclipse!) then count on TerraEsperZ to be your guide. He's even labelled the items and bosses, and mapped out the Chaotic Realm and the Boss Rush challenge! 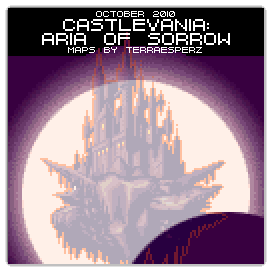 So to recognize the effort put into mapping the only work of architecture to be caught within the alignment of the sun and moon, TerraEsperZ's Castlevania: Aria Of Sorrow maps will be known as VGMaps.com's Maps Of The Month for October 2010. For this month's "Maps Of The Month" featurette, I wish to draw your attention to zerofighter & rocktyt's Metroid Fusion (GBA) maps. Another way that you might have a chance at helping Samus is from these complete maps by zerofighter and rocktyt. rocktyt (with some help from zerofighter) also mapped out Planet Zebes as seen in Metroid: Zero Mission, Samus's first mission in the Metroid saga. The whole Biologic Space Labs research station is here: the Main Deck, the six sectors, and even the Restricted Zone. Sure, the game has an auto-mapping function and a CO that walks you through the adventure. But nothing beats good old screenshot maps (especially when you need the nitty-gritty details like where all those Energy and Missile Tanks are hiding)! 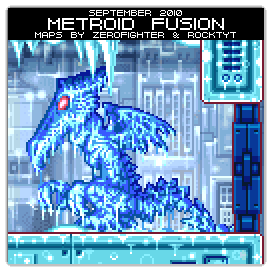 So to recognize the effort put into mapping the final chapter in the Metroid saga, zerofighter & rocktyt's Metroid Fusion maps will be known as VGMaps.com's Maps Of The Month for September 2010. For this month's "Maps Of The Month" featurette, I wish to draw your attention to Paco's Dragon Quest III (J) (Super NES) maps. Though originally released for the Famicom (and the NES), this game was remade for the Super Famicom eight years later with updated graphics and new areas. Unfortunately it did not see an official Super NES release outside of Japan. But that won't stop VGMaps.com from recognizing Paco's maps for it! 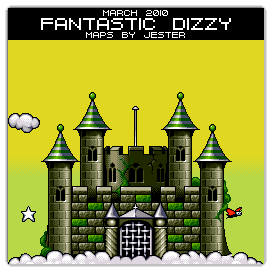 Fully-labeled Super NES RPG maps are almost a shoo-in for an eventual Maps Of The Month honour. And when the game is as big as Dragon Quest III, it's not hard to see why it's deserving. There are item locations marked, stairway paths labelled, and shop lists with prices. All this on over 90 maps, including maps for each of the introductory scenarios and every phase of New Town. "Cartographer" isn't a job class in this game, but wouldn't be necessary as Paco has mapped everything there is to see here. Even the Pachisi! 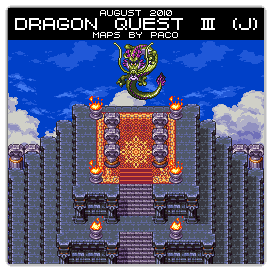 So to recognize the effort put into mapping a Japanese-exclusive RPG, Paco's Dragon Quest III (J) maps will be known as VGMaps.com's Maps Of The Month for August 2010. For this month's "Maps Of The Month" featurette, I wish to draw your attention to LDK's StarCraft (PC) maps. I hardly need to say anything about this game. If you play computer games at all, chances are you know what StarCraft is. Over a decade since its original release, the game is still popular in LAN parties, online, and in the entire country of Korea. The maps here are of the campaigns in the main game and the Brood War expansion. This game isn't just about the multiplayer! You might want to know your way around the galaxy as you lead your Terran, Zerg, and Protoss forces to victory. Mass carriers may not necessarily equal instant win...knowledge of the terrain might be just as useful. And you will also need to know where to direct your Zerg rush. Kekekekeke! 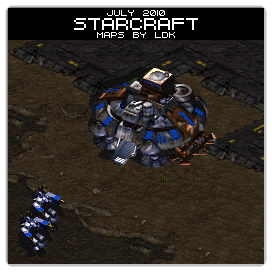 So to recognize the effort put into mapping one of the most renowned RTSes of all time, LDK's StarCraft maps will be known as VGMaps.com's Maps Of The Month for July 2010. For this month's "Maps Of The Month" featurette, I wish to draw your attention to xyzbilliu's Crusader Of Centy (Genesis) maps. Welcome to the world of Crusader Of Centy. A world that has had monsters inhabiting it, perhaps since the beginning of time. Despite humans dominating the light-covered surface, monsters continue to survive in the depths. A boy, becoming a man, receives a sword on his birthday, and goes to hunt monsters. Sure, it sounds like the start of any fantasy adventure game, but at least in this one, you can get your Dr. Dolittle on! Crusader Of Centy is blatantly influenced by The Legend Of Zelda: A Link To The Past. But though perhaps just one of several Zelda clones of the era, this is a fairly decent one. It predates the Zelda games that also feature time travel and animal partners, and this game also has a Sonic the Hedgehog cameo! And being that this is a game about being able to communicate with animals, the animal partners play a big role in combat. Does PETA have anything to say about that? Though there are only nineteen areas, some of these areas are actually fairly large. And there's some variety too...from the Place Of Peace to Black Night, the Tower of Babel and back in time, xyzbilliu has got the whole world of Crusader Of Centy covered. 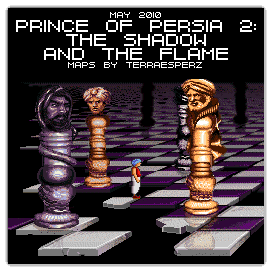 xyzbilliu previously received the Mapmaker Of The Month honour in July 2009 for Beyond Oasis, another great-looking top-down adventure game on the Sega Genesis that deserves more attention. 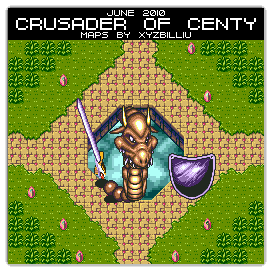 So to recognize the effort put into this crusade of mapping relatively obscure adventure games, xyzbilliu's Crusader Of Centy maps will be known as VGMaps.com's Maps Of The Month for June 2010. For this month's "Maps Of The Month" featurette, I wish to draw your attention to Revned's Mega Man 10 (WiiWare) maps. When Roll is afflicted with Roboenza, a disease that affects robots, Dr. Light and Dr. Wily work together to find a cure, to stop the chaos caused by sick robots that are out of control. Mega Man, as well as Proto Man, set out to defeat eight Robot Masters that hold the key to this cure; this time around, they're Blade Man, Chill Man, Commando Man, Nitro Man, Pump Man, Sheep Man, Solar Man, and Strike Man. In this game, a couple of the stages have branching paths. Also, the first castle stage has multiple routes. But Mega Man games have always been popular on VGMaps.com regardless of the complexity of them, and whatever charm the series has is maintained in its 10th main installment (11th if you count Mega Man & Bass). Revned, responsible for so many Mega Man maps, including all of the NES ones, is unsurprisingly the one who took on Mega Man 10. Finishing Sheep Man's stage before the game was even out for half a day, having the entire game done in less than a month almost seems late, considering - but still faster than most would expect from anyone else. By now it's available for all three major consoles' download services in all regions, so get it while it's hot, and hit up Revned's maps if you want to know what's around the corner. 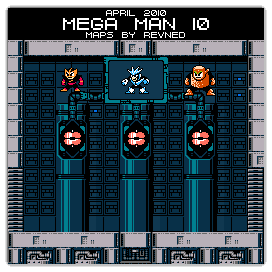 So to recognize the effort put into making these maps, only a month after its release, Revned's Mega Man 10 maps will be known as VGMaps.com's Maps Of The Month for April 2010. No joke! 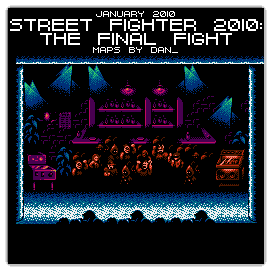 For this month's "Maps Of The Month" featurette, I wish to draw your attention to Dan_'s Street Fighter 2010: The Final Fight (NES) maps. Ken, a former Street Fighter, now a scientist, is the hero of this planet-trotting adventure. After his partner has been killed, his lab ransacked, and his Cyboplasm stolen, he must traverse five planets in order to track down the killer, and stop the spread of Cyboplasmic mutations. And to do that, Ken is upgraded with bionics, so that he can fight his way through the hordes of mutants and aliens. Surely, a story based in the future. As in, the future year of 2010! So to recognize the effort put into making these "futuristic" maps, Dan_'s Street Fighter 2010: The Final Fight maps will be known as VGMaps.com's Maps Of The Month for January 2010. Congratulations and thanks to the Mapmakers of 2010!